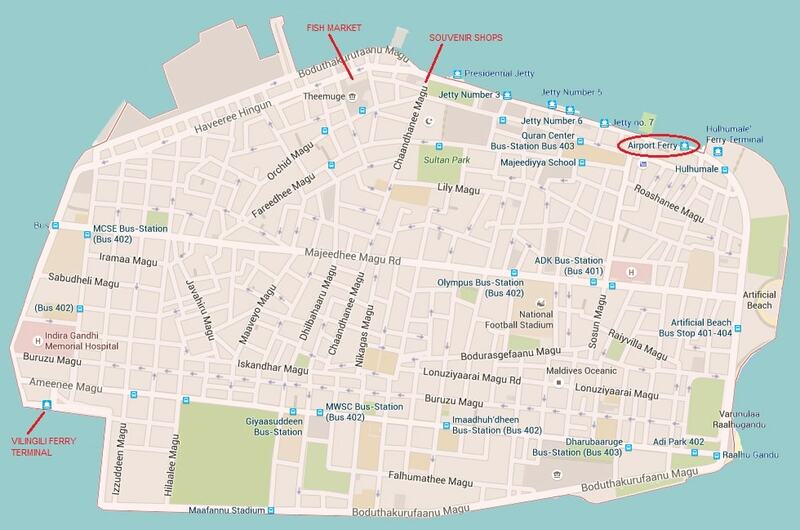 Detailed information and maps below show exactly where is Maldives located on world map. 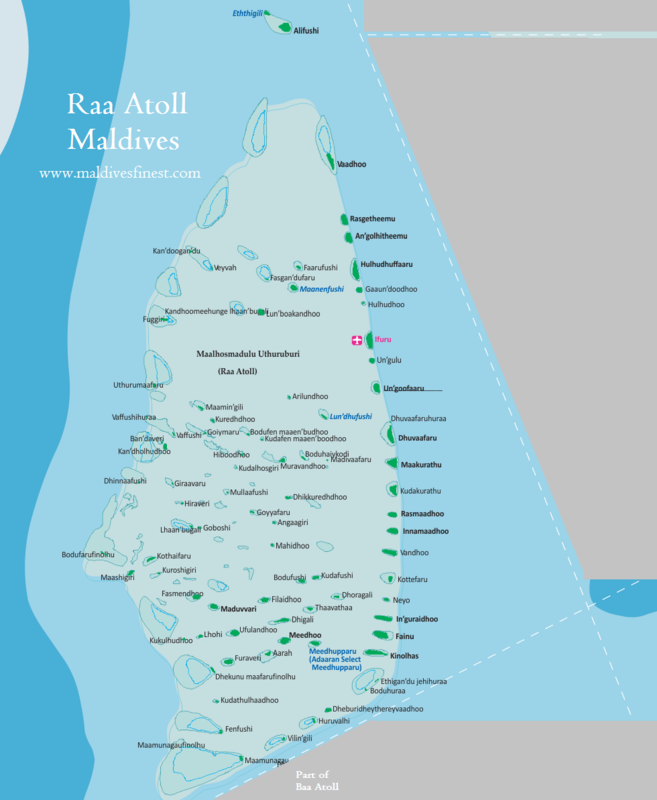 Map of Maldives then shows local islands, resorts, airports etc. Maldives is chain of 1192 islands located south-west of Sri Lanka and India in the Indian Ocean. The islands are so tiny that many world maps do not show Maldives. It is an independent country of about 357566 in population. Maldives is a member of the United Nations (UN), South Asian Association for Regional Cooperation (SAARC), Commonwealth and many other international organisations. Major economic activities are tourism, fishing, construction. The economy is mainly based on foreign currency generated through tourism, 99% of household goods are imported from other countries. The local currency is called Rufiyaa but US Dollar is widely accepted throughout the country. Maldives is an Asian country. The closest countries are Sri Lanka and India. It takes about an hour to fly from Srilanka to Maldives, a little bit more than an hour from Trivendrum of India. Every island is surrounded by water and totally disconnected from other islands. It takes about 5 hours to fly from Malaysia, Singapore and Thailand. About 8 hours from Guangzhou of China. 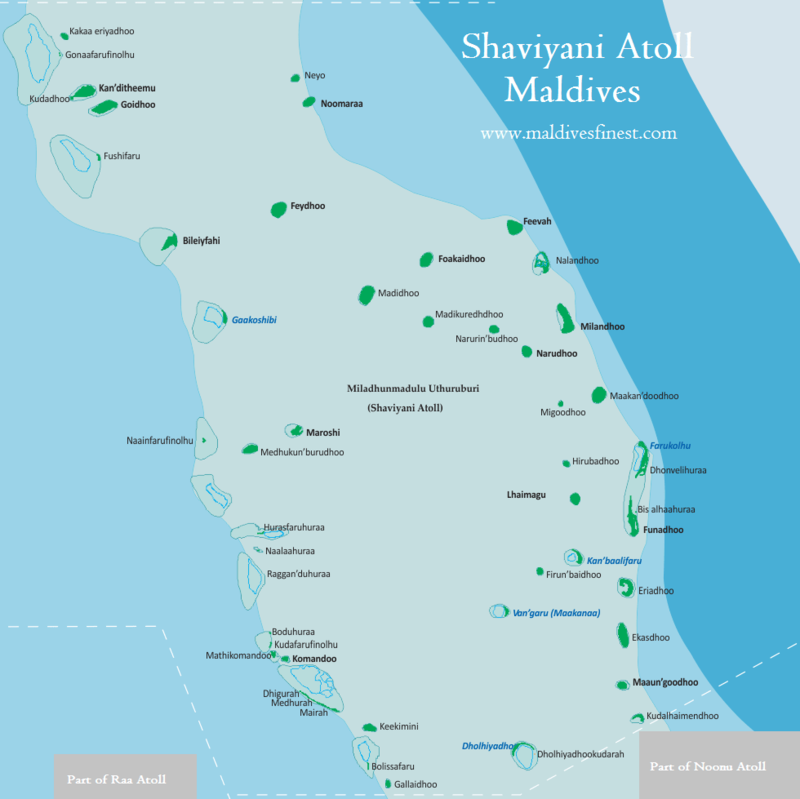 This map also shows all countries of Asia and the location of Maldives in the region. Asia is mainly divided into three regional sectors. South Asia comprises of Afghanistan, Bangladesh, Bhutan, India, Nepal, Maldives, Pakistan, Sri Lanka. Southeast Asia includes Indonesia, Malaysia, Singapore, Philippines, East Timor, Brunei, and Christmas Island, Cambodia, Laos, Myanmar (Burma), Thailand, Vietnam. East Asia consists of China, Hong Kong, Macau, Taiwan, Japan, Mongolia, North Korea, South Korea. Now you know where is Maldives and blow is the map of all islands, including local residential islands, all Maldives resorts, uninhabited islands, airports etc. If you are looking for the location of a specific island it is not easy to spot from 1192 islands. But, if you know the atoll it is easy. Just scroll down till you reach the atoll and then search that particular area. If you are planning your holiday in one of these islands you can check which are the closest islands near your chosen destination and plan trips accordingly. In case you have booked more than 1 resort to stay, you can check location of the other resort and anticipate what you might see during the journey. 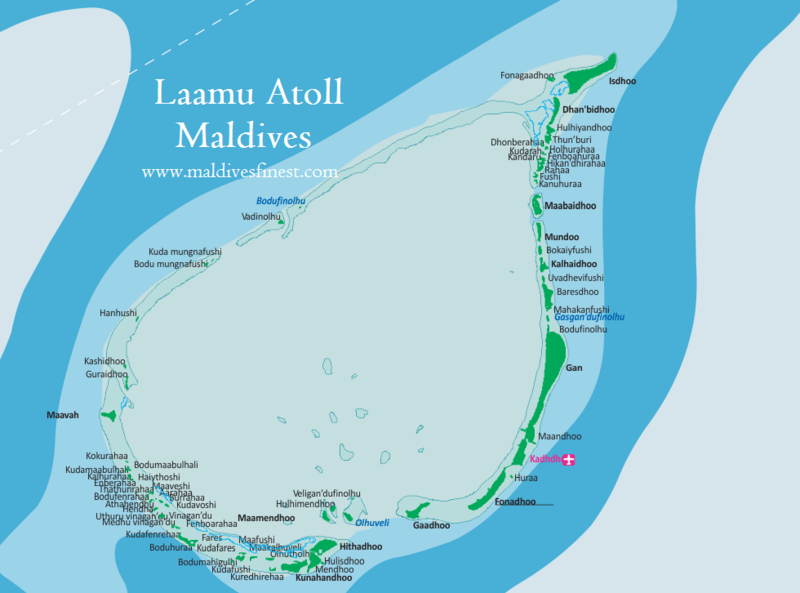 Below the map there is a list of atolls. 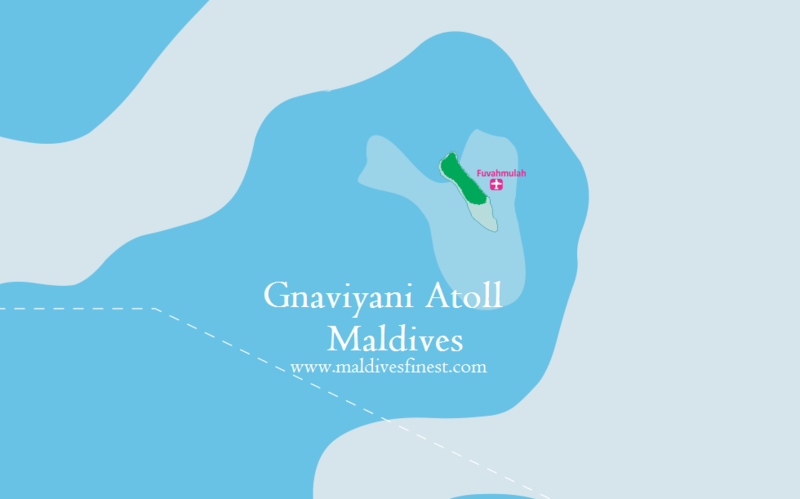 We are adding detailed map of each atoll there. 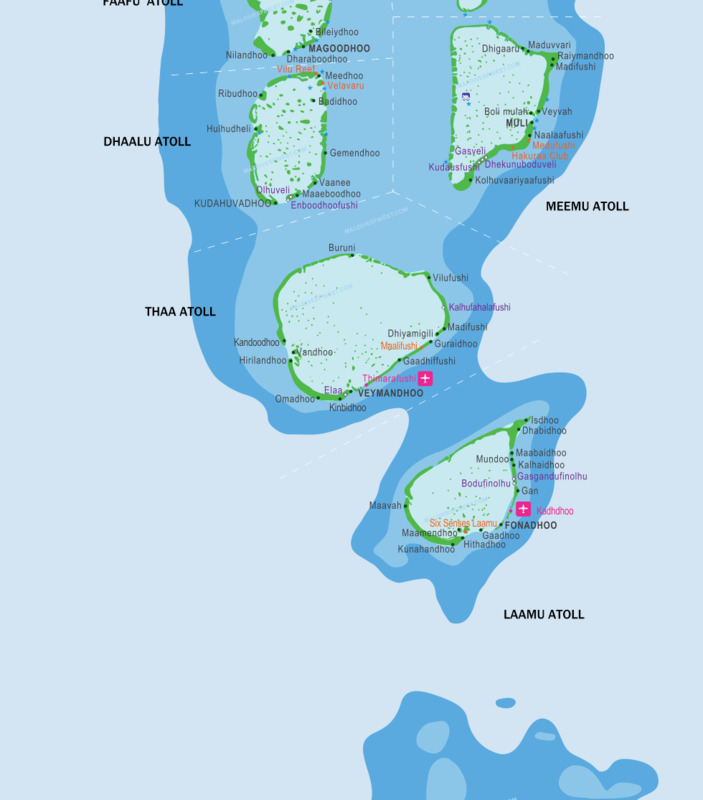 There are the 1192 islands in the Maldives and this map shows them all. 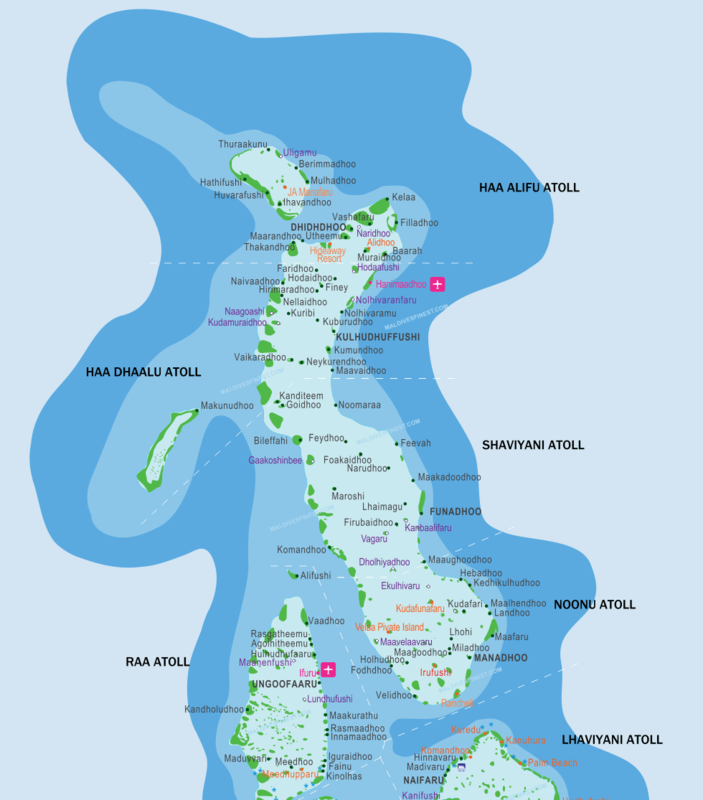 The country is naturally divided into 26 atolls or chain of islands. You can see this very clearly on the map. 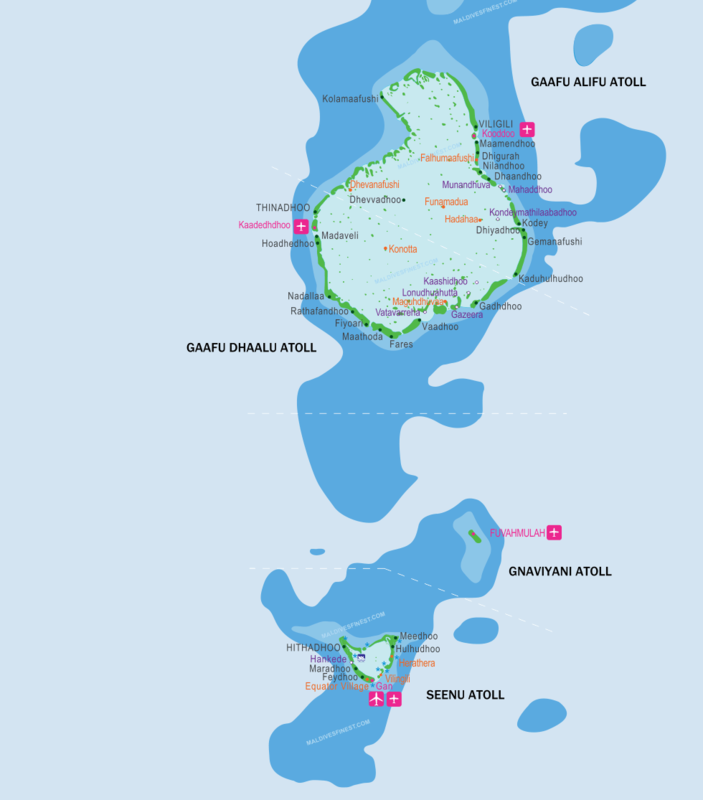 For administrative purposes the government has divided it into just 20 atolls. Scroll down to Kaafu Atoll to see the international airport at Hulhule'. 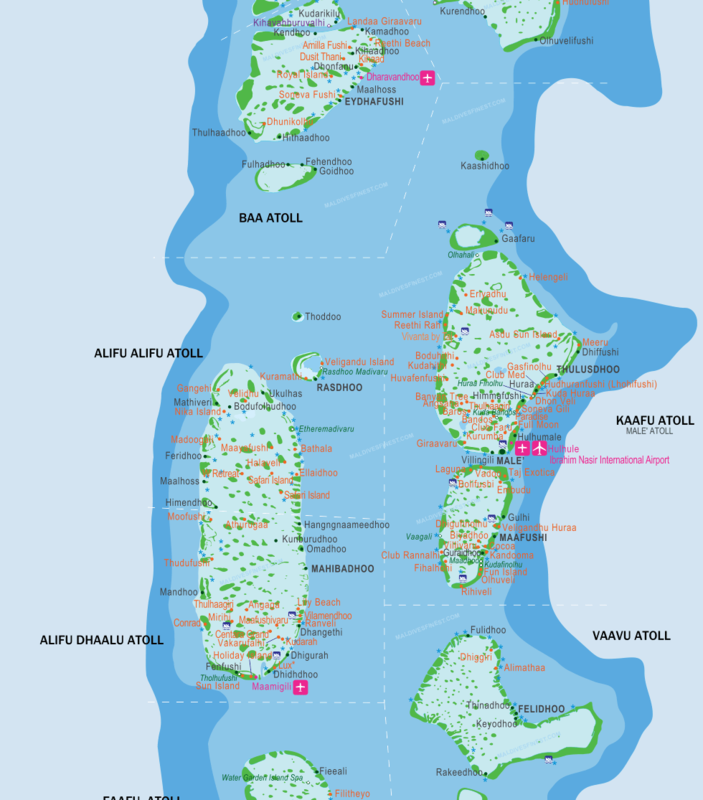 Kaafu Atoll being the location of main airport it is the busiest tourism zone, other popular atolls include South Ari Atoll, North Ari Atoll, Baa Atoll. 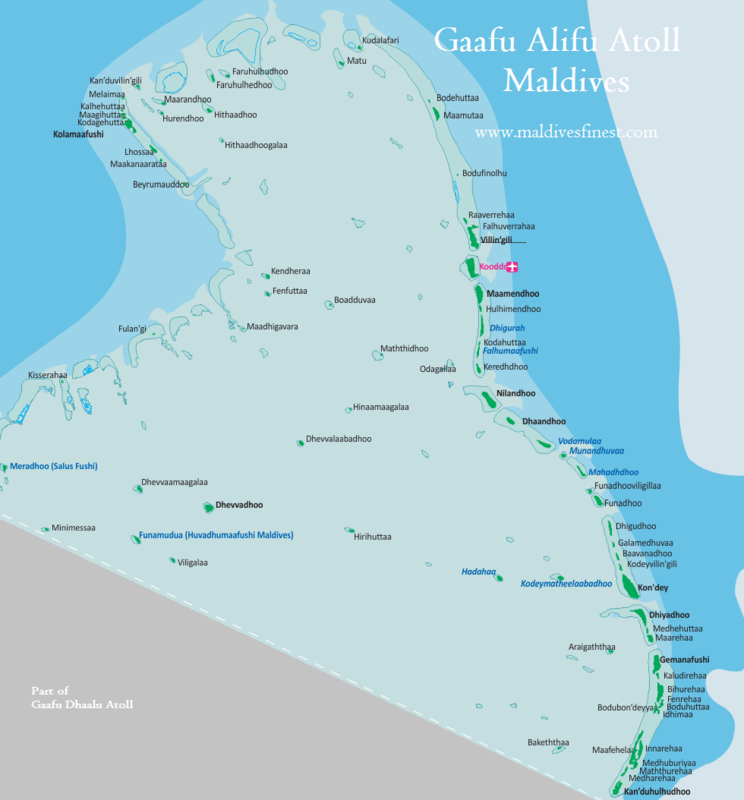 None of the atolls are bad, having said popular it simply means there are many resorts around. Tourism has been booming in Noonu Atoll in the last few years, especially in luxury tourism. See the map of shows many islands in close proximity, this could be one of the reasons for attracting both investors and tourists in luxury sector. Sandbanks are not marked on above maps due to the fact that sandbanks change their location seasonally, usually twice a year. Therefore, it is difficult to locate the exact spot of the sandbanks. Also, due to global warming some sandbanks are disappearing from the surface, the baby islands at some point may even re-appear. 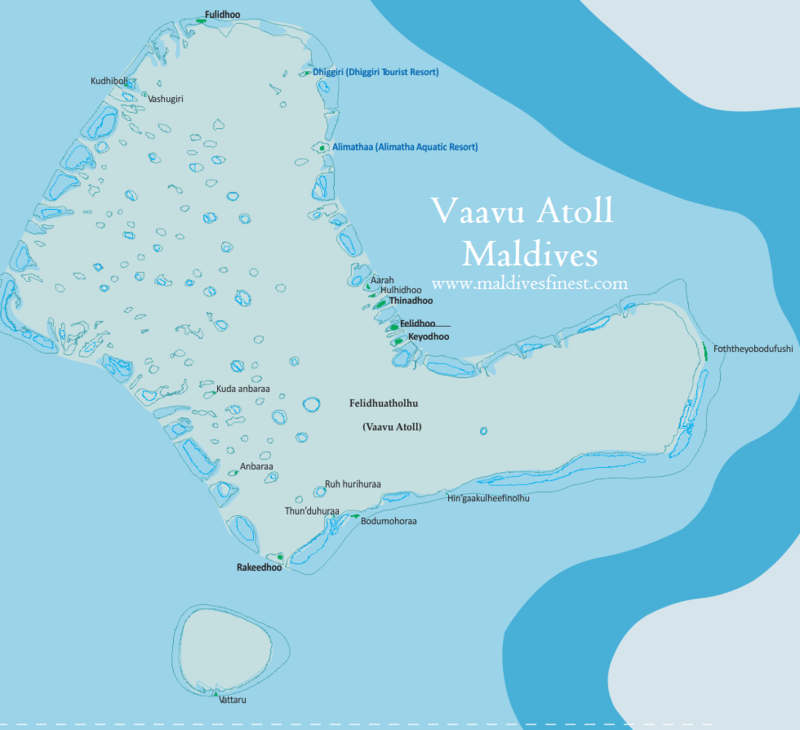 On the Maldives map atoll names are on both sides in large font size. 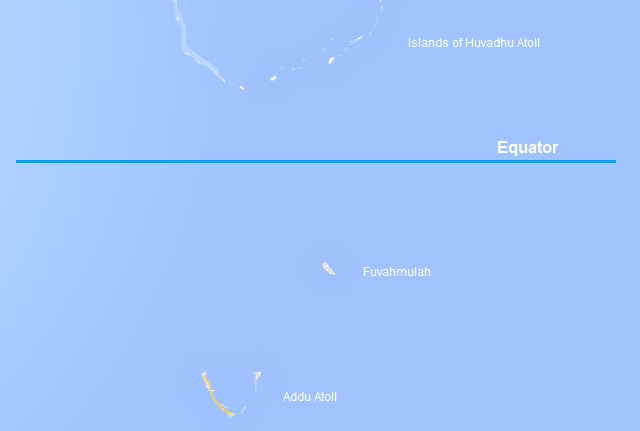 The dotted white line separates each atoll from the rest of atolls. 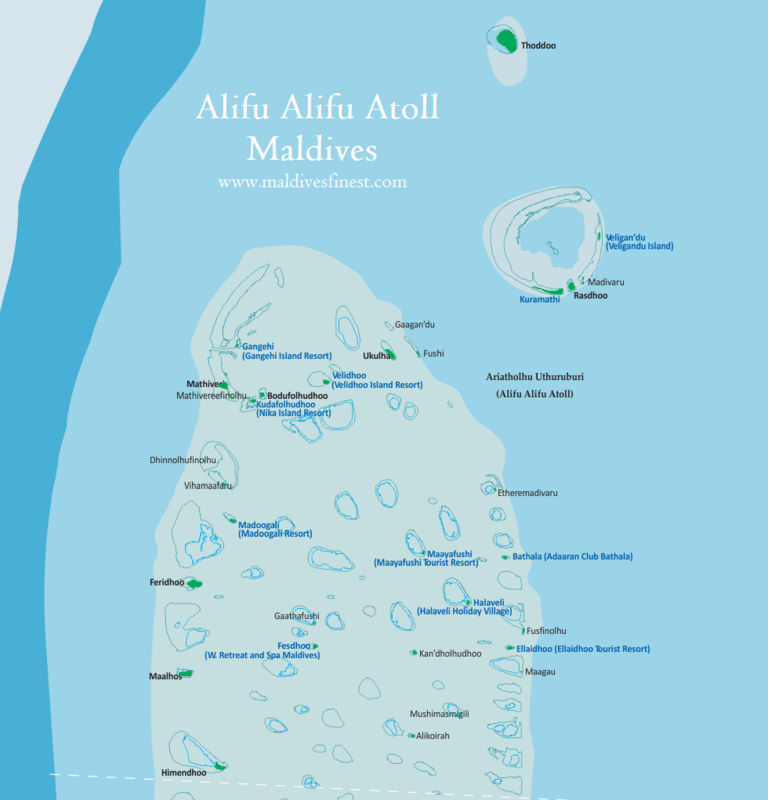 Some parts of the map show atolls one by one (from top to bottom), in other places the atolls are located side by side which is often referred as double-chain formation. In rough weather the outer atoll seas are more choppy, but in fine weather it is unnoticeable. • Taj Exotica - Just 10 minutes from airport. 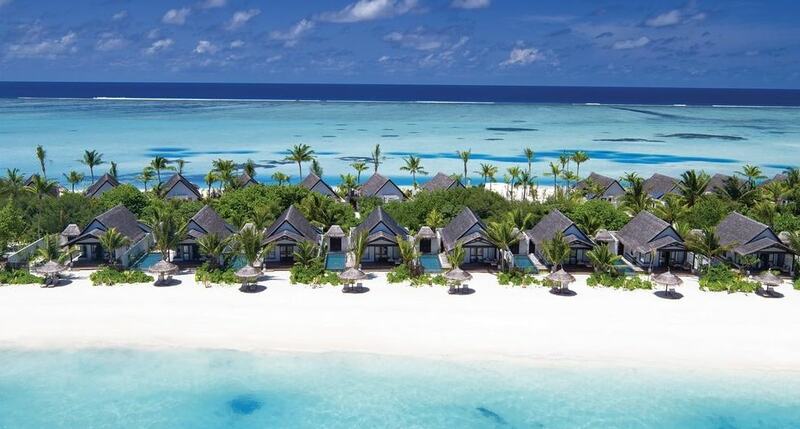 • One&Only Reethi Rah: About an hour from airport. • Jumeirah Vittaveli - About 20 minutes from airport. • Velassaru Maldives - About 15 minutes from airport. • Sheraton Fullmoon Resort - About 15 minutes. • Kurumba Maldives - 5 minutes. • Meeru Island Resort - About 30 minutes. • Paradise Island Resort - About 15 minutes. • Bandos Island Resort - About 15 minutes. These are just a few to name quickly. Discover more resorts using the map. Between airport and Male' there are ferries every 10 minutes, this is from 5am till midnight, after that ferry operations are not frequent till next morning. Where is Maldives? Is it in India? Surprisingly some people tend to think Maldives is a part of another country. This is 2019 and such people from around the world still exists but the answer for them is very simple. The formal name "Republic of Maldives" is an independent sovereign country with its territorial waters and land defined, and recognized by international bodies such as United Nations, Commonwealth. Maldives is widely known throughout the world and have foreign relations with all major countries of the world. Maldives is not in Zanzibar, Seychelles, Mauritius, India, Indonesia or any other country. Maldives is a country in Indian Ocean. The country is headed by a democratically elected president. Judiciary and parliament are independent bodies of the state. 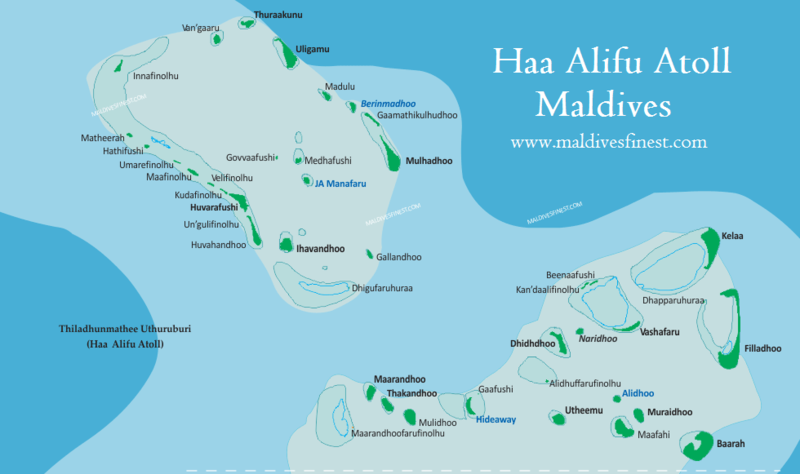 Maldives is divided into 20 atolls which are run by local councils, atoll councils or city councils, under the Constitution of the Republic of Maldives. Maldives is not a part of any country, not even attached to protection of any specific country. Like other independent countries the government headed by the President Of Maldives administers the country. The world map shows geographical separation of Maldives from other countries. 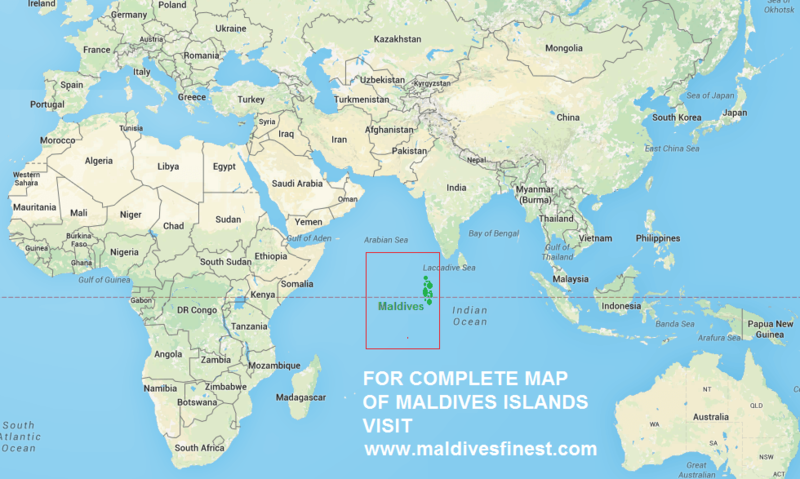 Maldives is one of the many countries located on the equator which divides North Pole and South Pole. The country is stretched narrowly from north to south of the globe and equator crosses between Fuvahmulah and Gaafu Dhaalu Atoll in the southern parts of the nation. 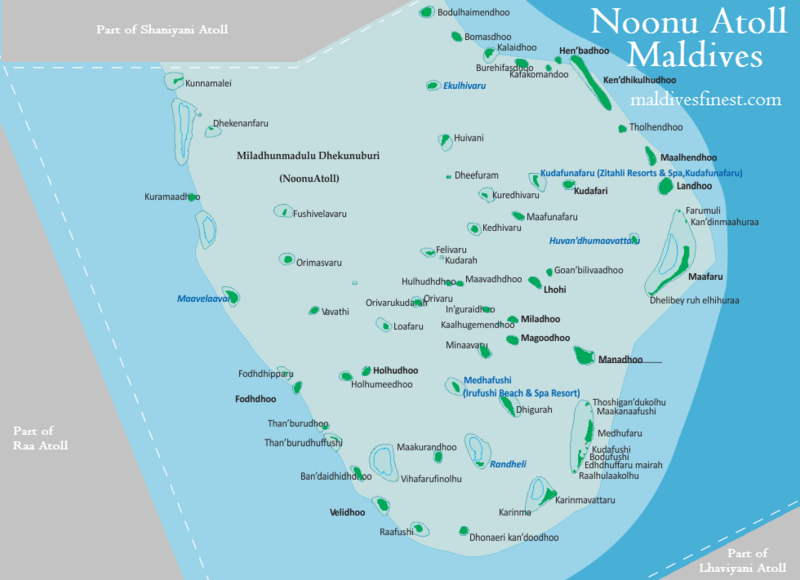 Out of over 1192 islands in the Maldives each has has unique characteristics in terms of geography and people's lifestyle. Fuvahmulah is one of those unique islands which has native fish and a bird which is not found in anywhere else in the Maldives. But, nothing seems to be remarkably different just because of the equator, except that the people speaks a different dialect of local language which most of the other locals dont understand at all. 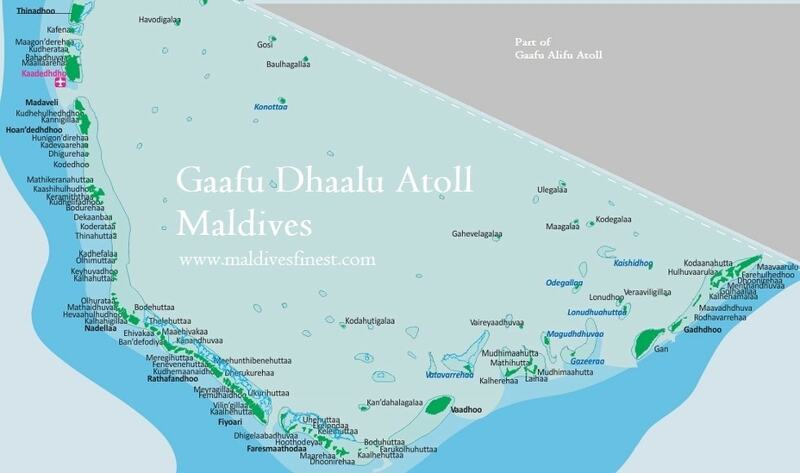 In fact the atolls at the equator such as Addu Atoll, Fuvahmulah, Gaafu Dhaalu and Gaafu Alif Atoll (collectively called Huvadhu Atoll or Huvadhoo Atoll) have a different dialect in each atoll. The dialects are similar, but also different to a significant degree. Maldives is made up of 1192 coral islands dispersed over an area of 90000 square kilometers in India Ocean. 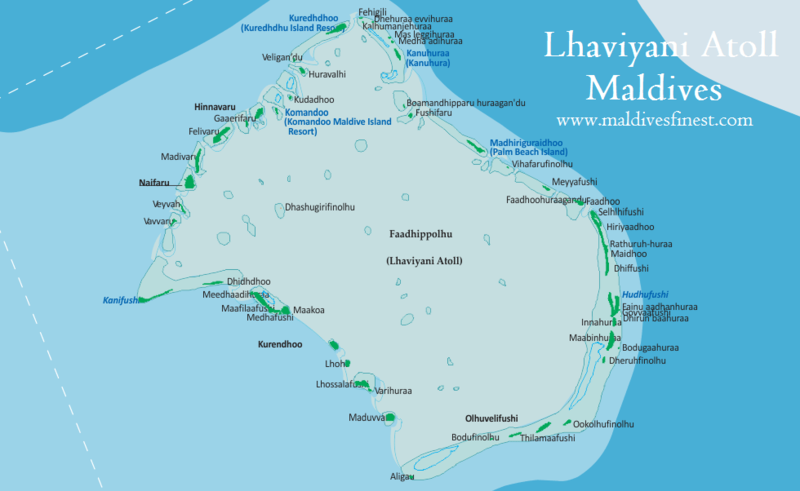 The islands are naturally grouped into 26 atolls. Each island is surrounded by sea, means you will need a boat to visit the island. It is common to find many islands sharing same lagoon, in the same area there are individually isolated islands as well. 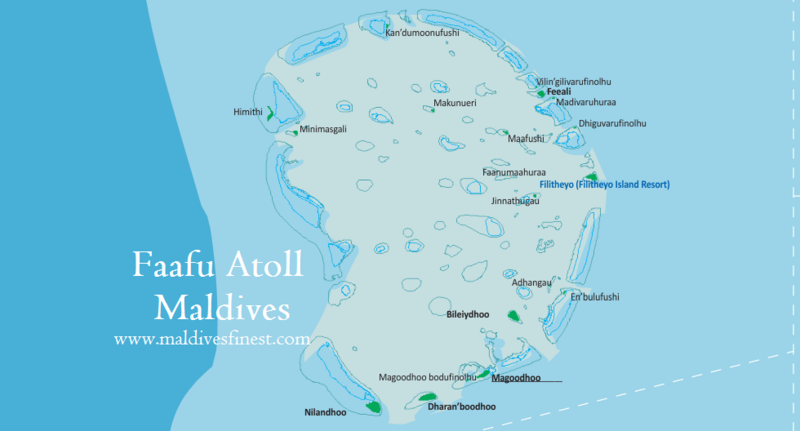 Most of the islands have its own house reef that protects the beach and some atolls have outer reef that protects the entire atoll. 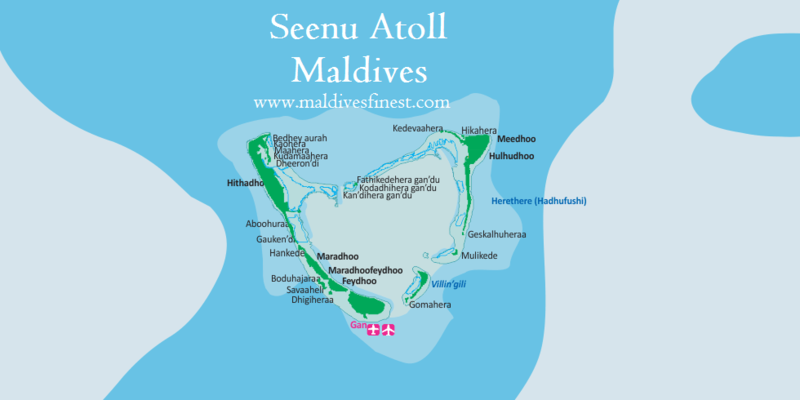 Read more on Maldives geography and geology. It is believed that Maldives is formed atop inactive super volcanoes, each atoll is such a volcano with islands formed on the rim. That could be the reason the islands in each atoll is somewhat circular in shape. Maldives is small but old country, historical evidence shows the Maldives is more than 2500 years old. Through out history Maldives was independent with exception of few foreign invasion that did not last long. The country had a ruler; a king, queen, sultan or president for the past 1000 years and more. How many islands in Maldives? The official count of Maldives islands is 1192. This number was established several decades back. Over the years we have observed some sandbanks being converted islands. Also there has been some reclaimed islands developed for tourism. Currently there are multiple land reclamation projects on going in Kaafu Atoll, near Male', and many of these projects involve reclaiming land in the lagoon, thus forming new islands. 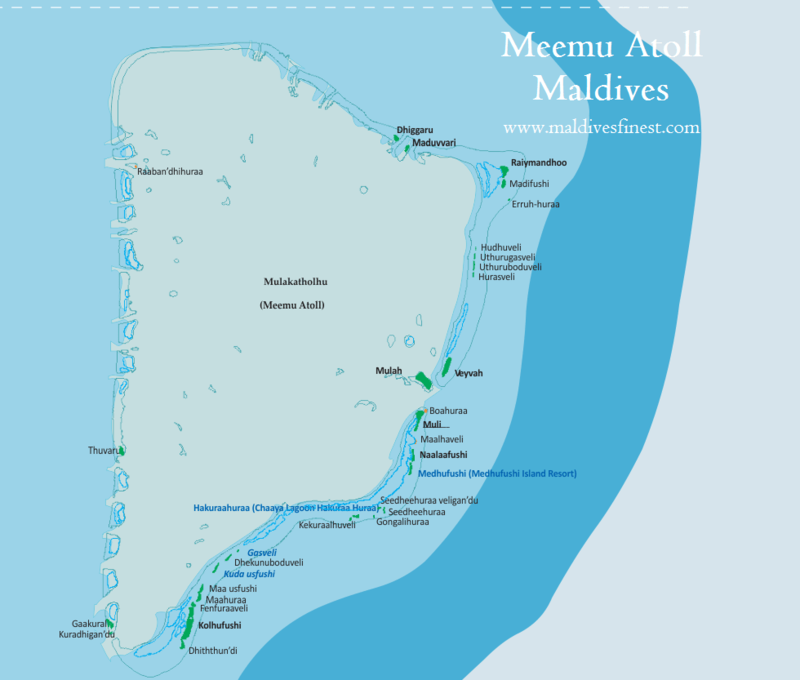 Therefore, present count of Maldives islands would most certainly exceed 1200. It was recently discovered by Maldives Finest that the islands on the north of Maldives have significantly less rainfall over the year. 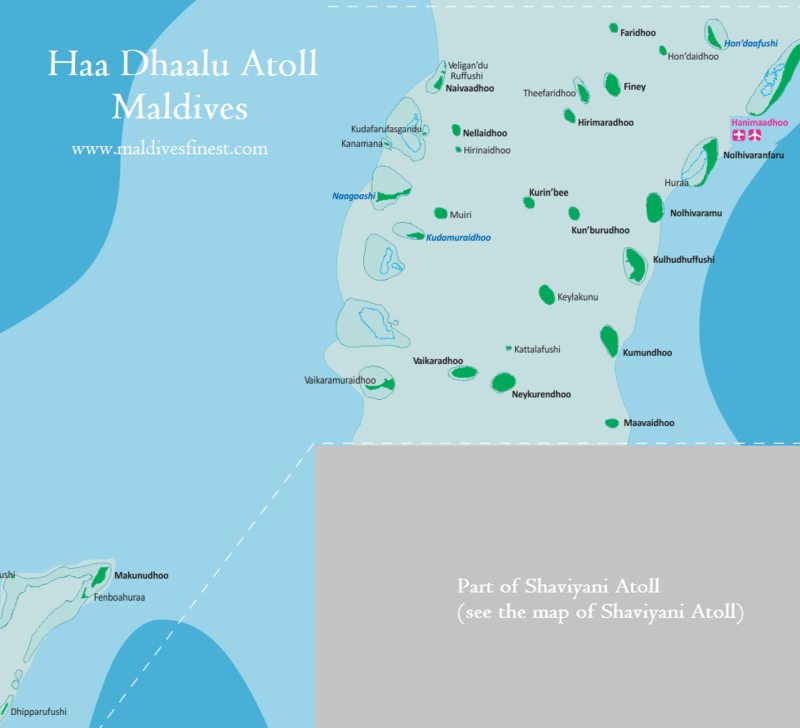 The northern most atoll is Haa Alif Atoll, followed by Haa Dhaalu. 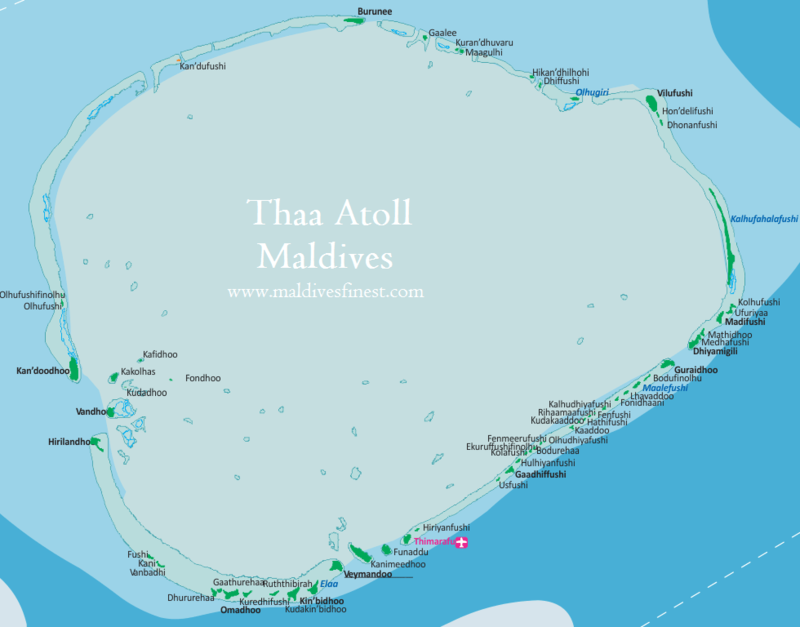 It is very easy to locate the islands and atolls because these are at the very top of the map. 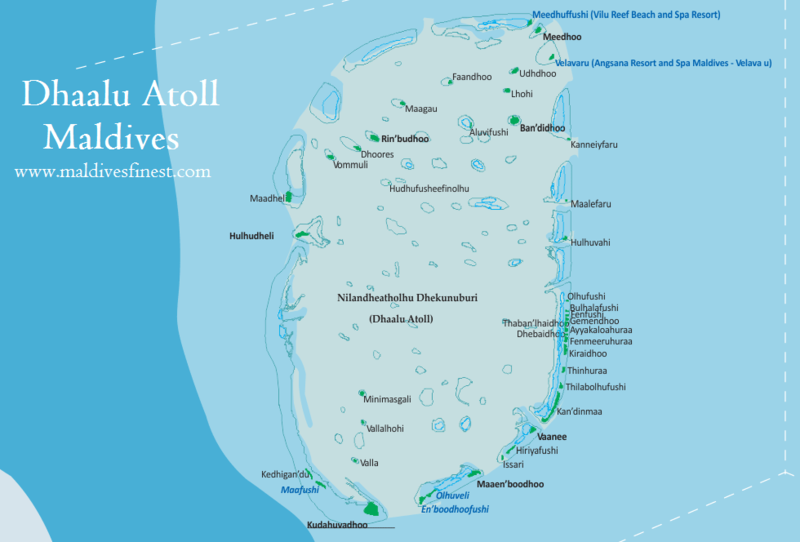 Scroll up and see the first atoll. Yes, it is the northern parts of the country. Capital Male' is located in the mid region, southern atolls are on the bottom. 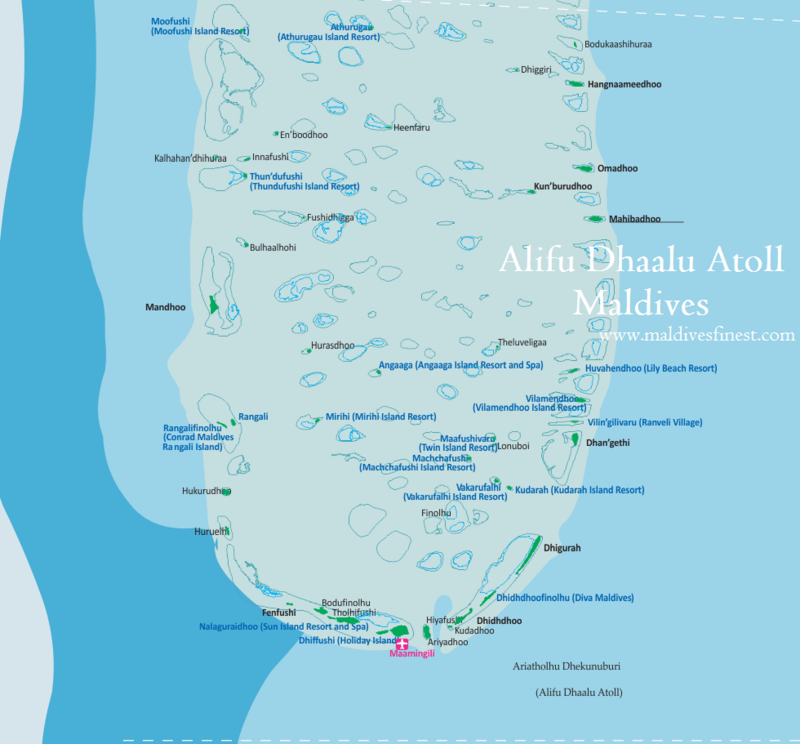 To visit Haa Alif Atoll you can fly to Hanimadhoo from Male' International Airport, by domestic flight. 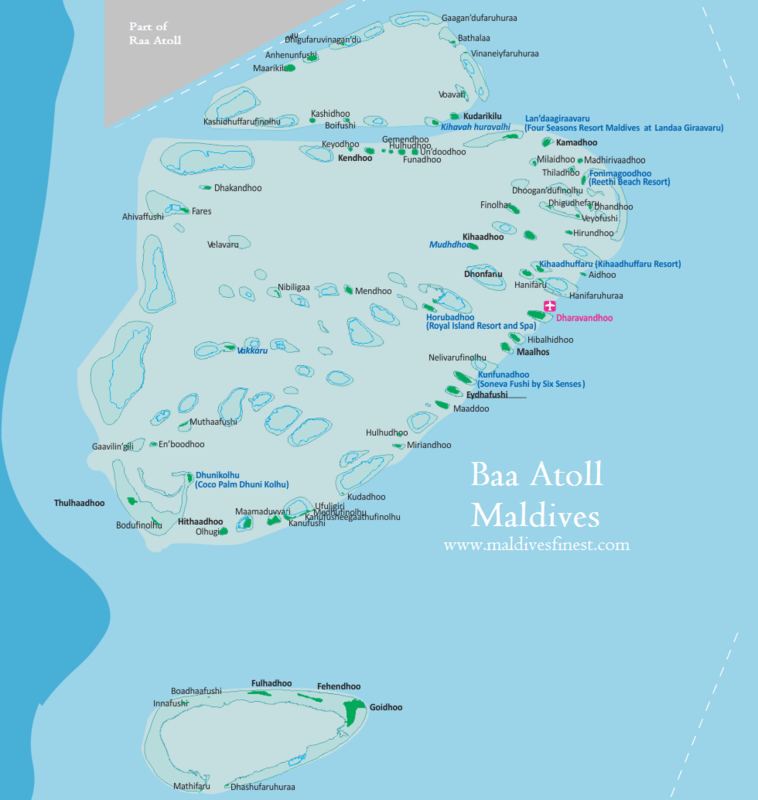 If you are seeking islands in the north reachable by seaplane, there are many resorts in Noonu Atoll and Baa Atoll. Seaplane takes about an hour to Noonu Atoll from Male', and Baa Atoll it is approximately 45 minutes and varies from island to island. If you are planning your first holiday you may be wondering about the things you can do. The main activities you can do include scuba diving, snorkeling (see best reefs for snorkeling), watersports, in-land sports, excursions. Scuba divers usually do diving everyday, relax and enjoy evenings in bars. The same pattern applies to snorkelers who spend hours and hours doing just that. Watersports people are often not that regular, guest who love watersports often try many other activities. Most common watersports includes banana riding, catamaran sailing, waterski, wake-boarding, windsurfing, paddling, jetski etc. There are some resorts that offer parasailing and kite surfing too. Excursions are the most interesting. They include sunset fishing, dolphin watching, snorkeling trips, island hopping, shopping trips, romantic escapes, sunset cruise etc.